Spanish terra cotta tile mural for a kitchen backsplash, tabletop or wall from Mexico. 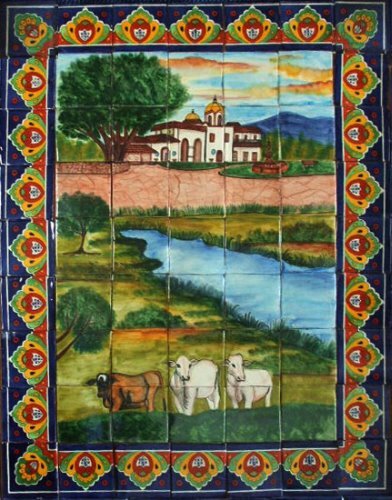 Tile mural "Cattle" dimensions are 28 x 36 inches artisan produced using brown, white and blue paint on a green color background. This Spanish talavera mural was made using 4x4 (10x10cm) ceramic tiles. Free shipping to Mexico, and the US. Kitchen Tile Mural "Fruit Bowl"
Kitchen Tile Mural "Cheese, Wine and Roses"
Kitchen Tile Mural "Catrina 2"